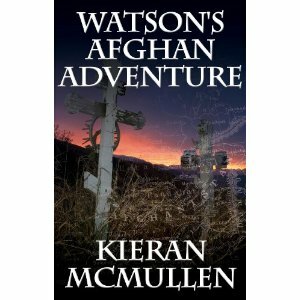 US Holmes Society Review: WATSON’S AFGHAN ADVENTURE, by Kieran McMullen (London: MX Publishing, 2010, 216 pp., $16.95), is a Watsonian pastiche that offers his own account of his adventures in Afghanistan,which were far more colorful than his brief report in the Canon; it’s a story of romance and treasure and the battles of the Afghan War. Timea Pal: McMullen’s army background really comes out in this book. As a Watson fan I was looking forward to reading it but found myself really taken by the authentic feel – like it had been written by someone who was there – which I guess is the case. In his bio he mentions civil war reenactment and that again isn’t surprising as throughout the book the detail on the weapons of the era is excellent. Will be enjoyed not just by Holmes pastiche fans, but also those into military history. Sharon-E: (London, England) – Arthur Conan Doyle covered most of the avenues of enquiry about Holmes across all the stories but when it came to Watson many questions were left unanswered – especially about his military career. Watson’s Afghan Adventure answers many of these and is a fascinating story in its own right. Holmes fans will love it, as will those interested in military history. McMullen’s own military experience shines through and gives the book hearty authenticity. LyndaE: This book was exciting from the very first page with lots of actual military history and events which were fascinating! I read it cover to cover in only a few hours. It was very difficult to put down once I had started reading. The historical accuracy was astounding not to mention entirely accurate. The authors attention to detail and factual story line make it a fantastic read. Any avid Sherlock reader will not want to miss this fascinating tale. Kuddos to the author! Charlie077: Wonderful read. Detailed and pacy and of course featuring one of my favourite characters in Watson – what more could you ask for.